How ‘Green’ Is Your Dog? Not Very. 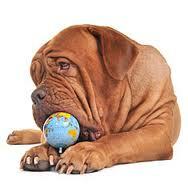 “Pet food is the primary cause of dogs having a high ecological footprint. The pet food industry in the UK is now worth an estimated £2bn a year and in recent years, despite the financial difficulties, there has been an increasing demand for ‘boutique’ pet foods – pet foods that contain real, natural ingredients that even most people wouldn’t turn their nose up at, such as lamb, spinach and blueberries. The amount of manufacturing, production and air miles that go into dog food means that it is very carbon intensive. Vietnamese citizens? That’s nothing! What about those climate-conscious North Korean citizens? I hear the ones in prison camps actually reabsorb their own Carbon. Then again, in the wild the dogs are natural hunter-gatherers. maybe we should take them back to that natural lifestyle. Now I think of it, maybe we should go back to hunter-gathering too.